Delivery Area :: Pacific Coast Harvest - Home Delivery of Local Organic Produce. Pacific Coast Harvest is proud to be a local Seattle area business. 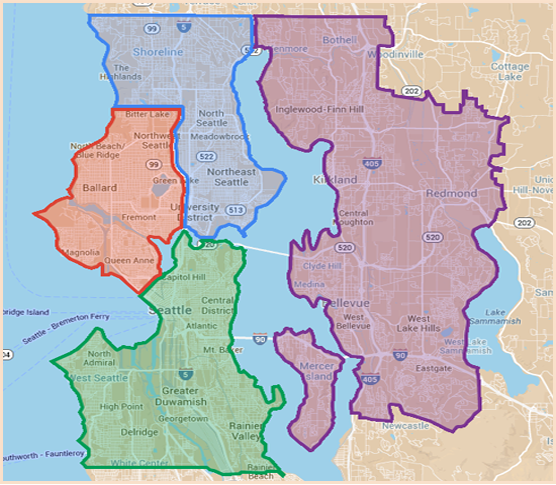 We currently offer delivery service in the areas highlighted on this map including neighborhoods in Seattle, Bellevue, Kirkland, Redmond, Shoreline and Mercer Island. We group deliveries in each geographic area to a specific delivery night to keep costs low, be predictable, and reduce our gas emissions.